The Monticello Rotary Club 40th Annual Monster Run Classic will be held on Sunday, August 5, 2018. The proceeds from the 2018 Monster Classic race will benefit the Sullivan County Veterans Coalition and is an event run by Monticello Rotary as part of Sullivan County Patriots Day. 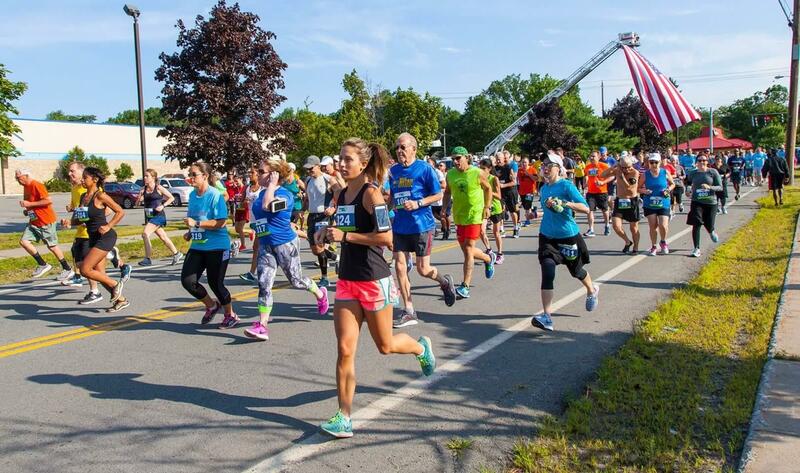 Each year this community event draws hundreds of walkers, runners and spectators from all over New York State. This race is expected to draw another very large turnout for this year’s event. The race consists of 5K and 10K running and 5K walk events for the whole family. This course proves to be challenging and is considered by many one of the best run/walk courses in the area. In addition, health, wellness and running related businesses will have information and free screenings on site during the event. Raffles, door prizes and an auction round out this family fun filled event. Many veterans’ including numerous Wounded Warriors, have signed up to participate. Their motto is, “Our Colors: Red, White & Blue Never Run……Except for the Monti Rotary Monster Run!” They look forward to running/walking with those they served to protect. So whether you choose run or walk any of the races, cheer on and be a supportive spectator, come out to show your patriotic support for the veterans, volunteer for the race needs, win some wonderful prizes or you are just attending to enjoy a beautiful Sunday morning in the Catskills, you will be sure to have a great time while supporting a great cause! Registrations can be completed online prior to the event at https://raceroster.com/events/2018/17920/the-2018-monster-classic-5k-10k-road-races In addition, registration will be held at the Monster Race sight (East Broadway off of Richardson Avenue) on Saturday, August 4, 2018 from 10am-2pm as well as the morning of the race. The awesome course may be viewed at https://youtu.be/lpL2UqFHvzM . For further information about the race, please contact Orshii Boldiis via email at oboldiis@hotmail.com or call (845) 239-2107. "Night Out Series" at Forestburgh Playhouse Amazing! 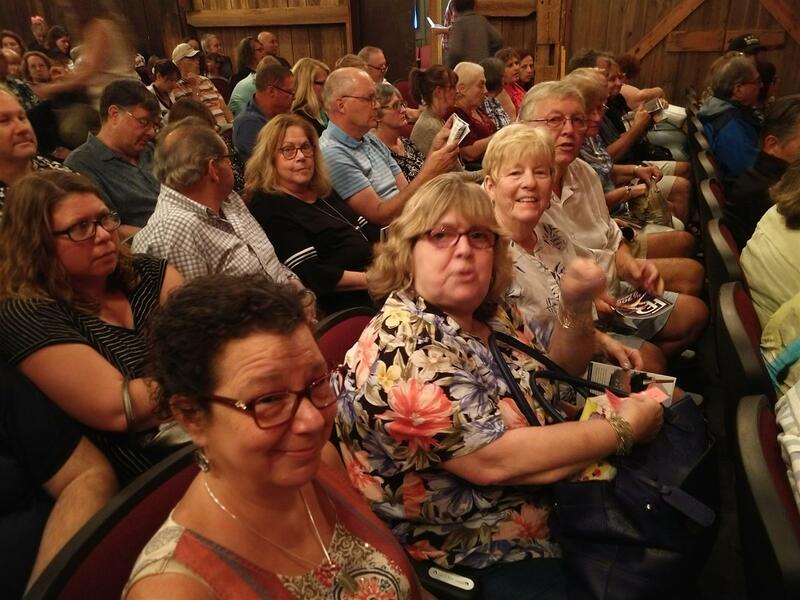 Monticello Rotary Club members joined with members of the Monticello Kiwanis Club in our "Night Out" series on July 17, 2018 for the opening night of "Annie" at the Forestburgh Playhouse. All we can say is, "WOW!" 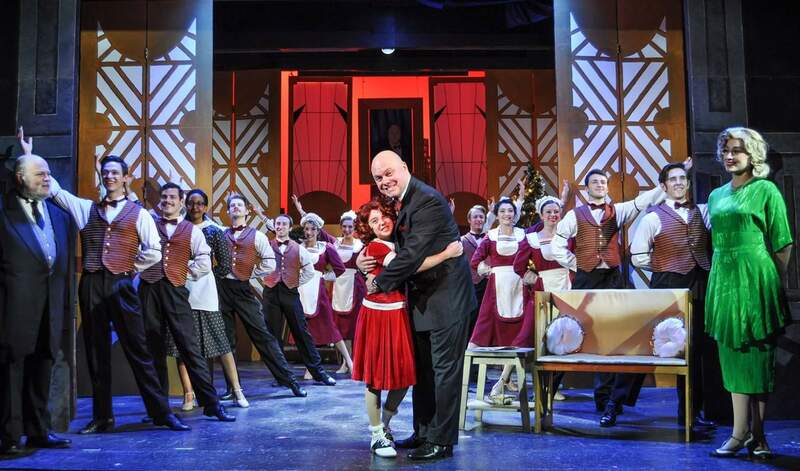 The performances of the Pre-show Cabaret and the Main Stage shows were simply AMAZING! We had a terrific night of fellowship and fun! 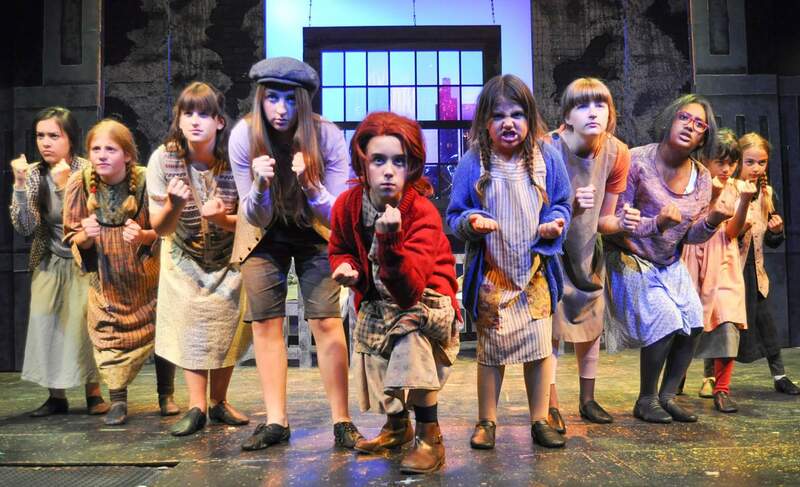 The cast, crew and staff were absolutely top notch! Thank you to our host, Franklin Trapp for a great evening of entertainment, food and friendship! We enjoy our "Night Out" with you each year and this year was no exception! 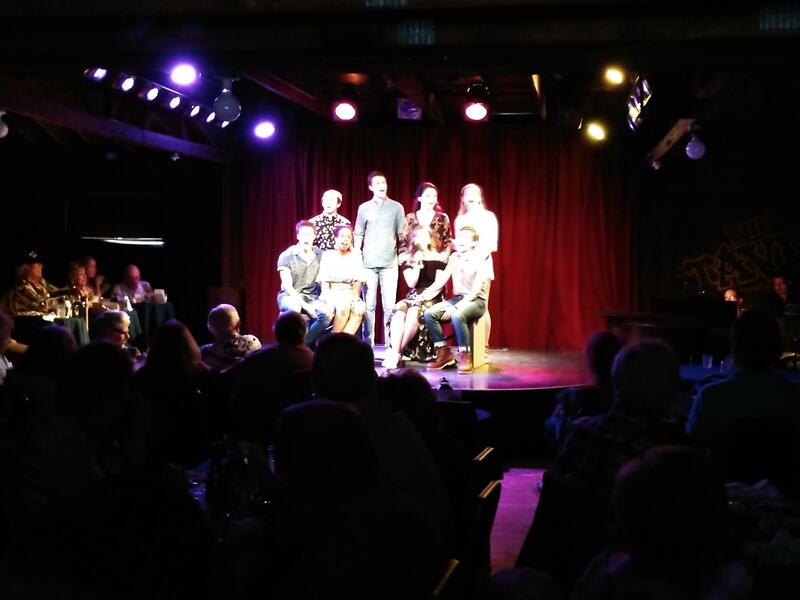 A fabulous Cabaret Dinner/Pre-show by this year's Resident Company filled with memorable tunes of the '70's and spectacular talent! We were all humming along but most of all Doug Muller! He knew every song and remembered all the lyrics! Getting ready for show time! 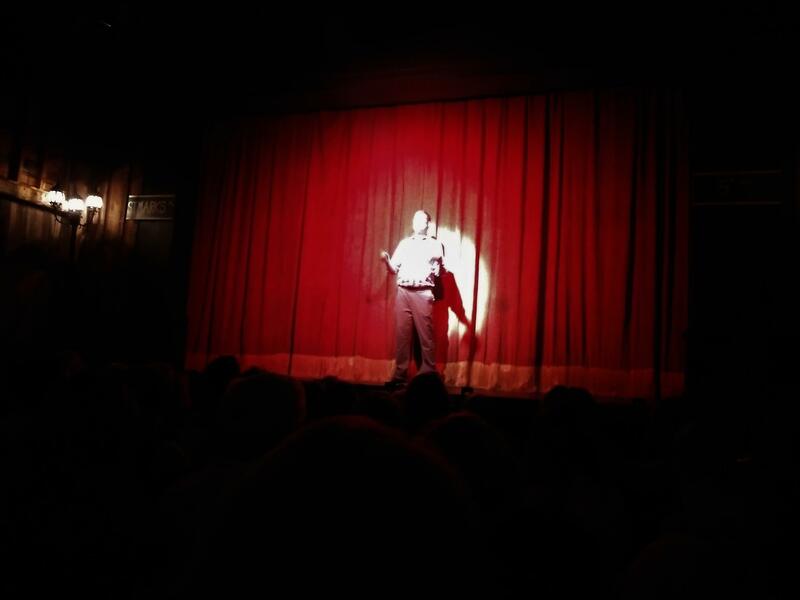 Franklin's Famous Curtain Speech! Wish we could have gotten a better picture but this was the best we had and wanted to make sure to include our fellow Rotarian in the photos! 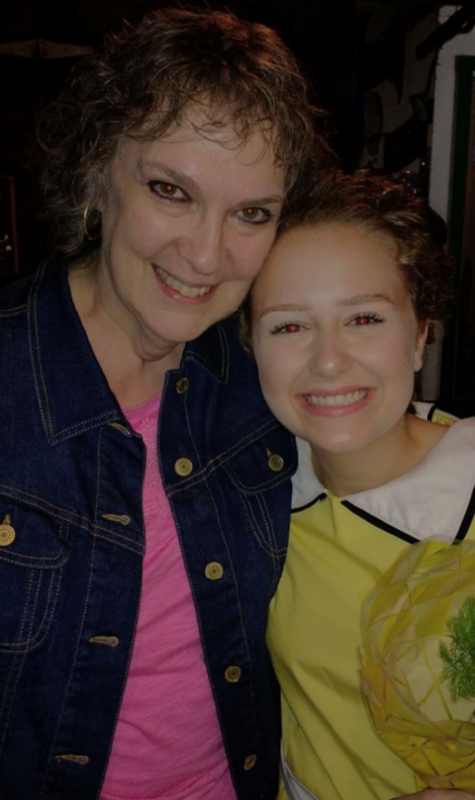 Back stage post show Rotary President Lori James congratulates one of her favorite "Orphans" Julia Hawthorne! 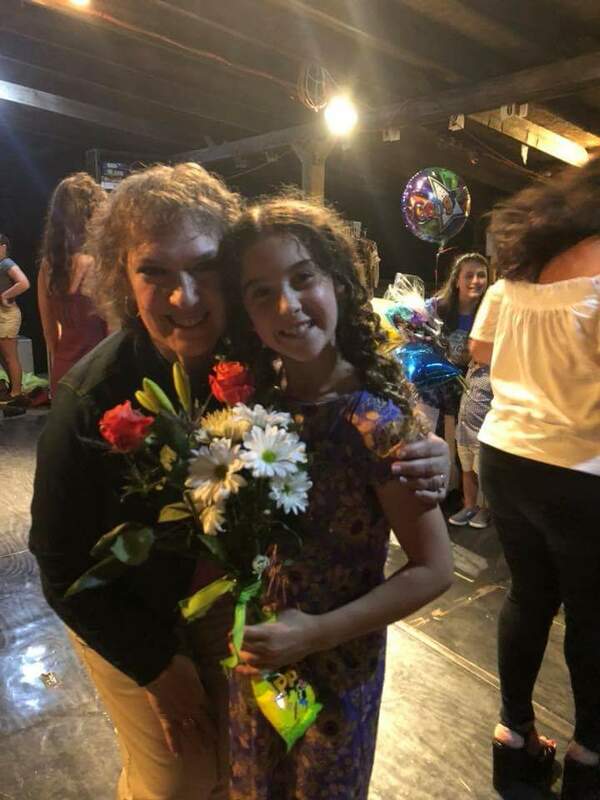 President Lori James congratulates "Annie" herself, Alicia Scali! 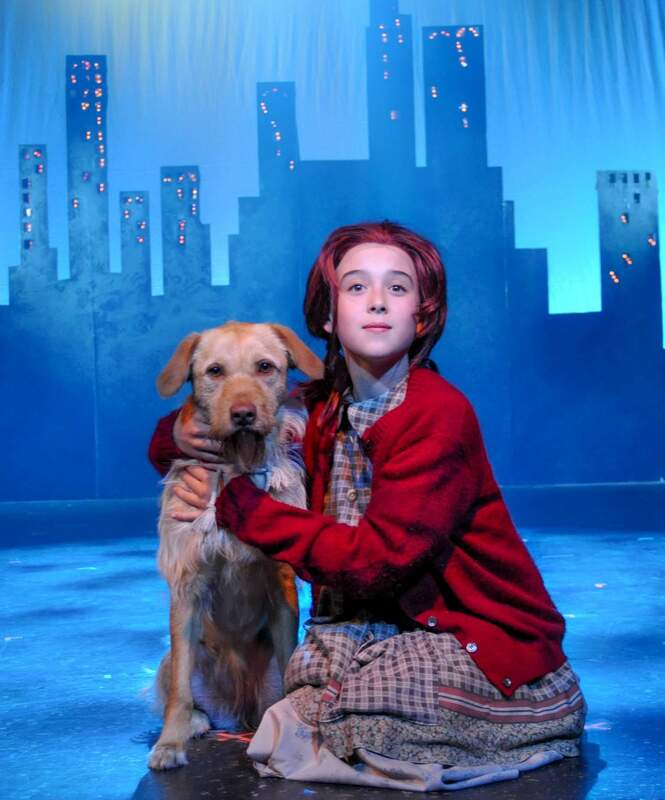 Lori performed with Alicia and Julia in "Music Man" at Forestburgh Playhouse "
a few years ago! "I am so proud of their growth and performances," said James! "They are both beautiful young ladies!" "I Don't Need Anything But You!" 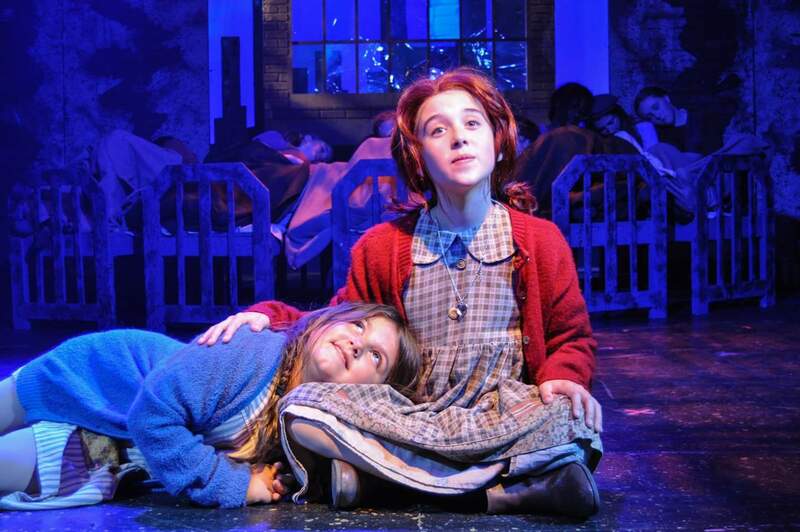 "It's a Hard Knock Life!" 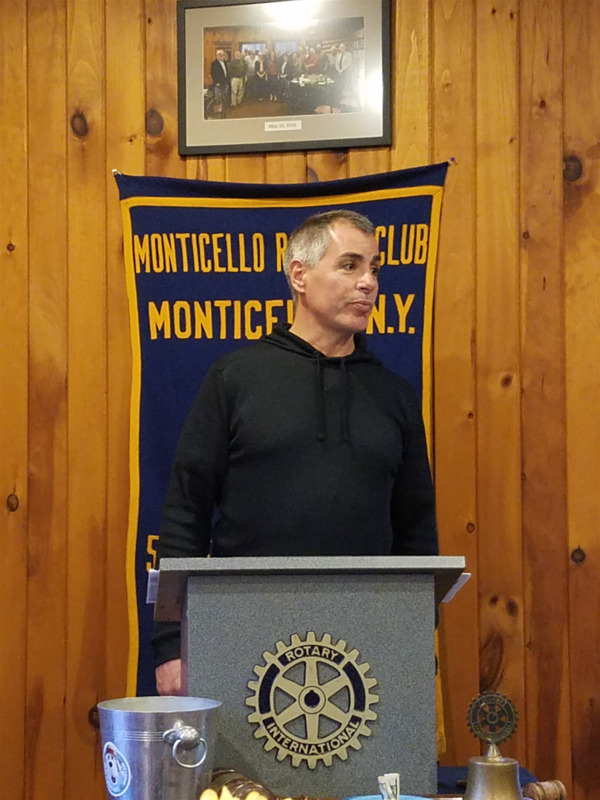 We were so pleased to have Catskill Regional Medical Center CEO Jonathan Schiller speak to the Monticello Rotary Club at our meeting last week. He shared with those present that CRMC takes a strong stance on the concept that "Wellness Starts At Home." To that end, there are many positive happenings occurring at our community hospital. Mr. Schiller shared the work that the hospital is doing with Catholic Charities to help stop the opioid epidemic happening in our community. He stressed that it has to be more than just Narcan training telling the club of the need for communicating with our children and parents. We must develop the appropriate dialoge to ensure that our kids stay safe and have an understanding of the destruction of this horrible condition. We have so much to be grateful for in our community and CRMC is one such "jem" in our community. Thanks for all of the information and keep up the great work! Monticello Rotary President Lori Orestano-James introduces the CEO of CRMC Jonathan Schiller. Monticello Rotary Members listen closely to Catskill Regional Medical Center CEO Jonathan Schiller about the great things happening at our hospital. 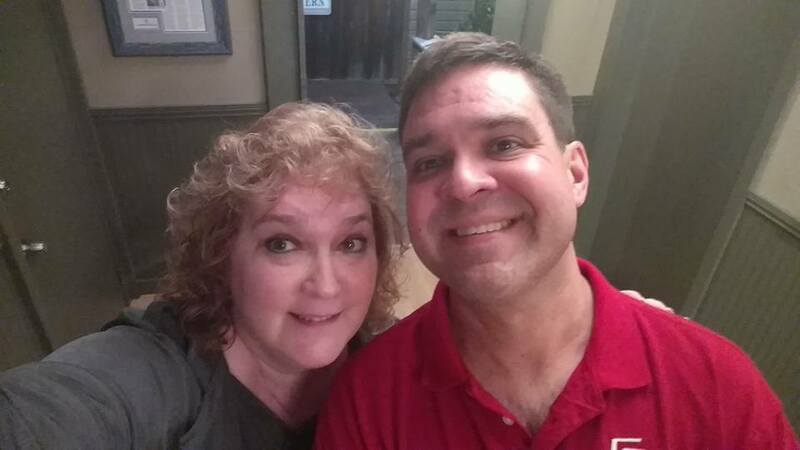 Monticello Rotary President Lori Orestano-James with CRMC CEO Jonathan Schiller. An evening of celebration was enjoyed by all at this year's Monticello Rotary Installation & Awards Dinner. All agreed that the food by Mr. Willy's was fabulous; music by Spencer Daniel Agency was wonderful; Desserts and Cake by DeFillipis was delectable; company was spectacular; heat was TOO much but it didn't matter! Congratulations to all of those honored for their Service Above Self. Distinguished Service Awards were presented to Dr. Randy Katz, Lori Orestano-James and Helen Diehl by outgoing President Barbara Carr. In addition, Orshii Boldiis was honored with the Four Way Test Award for his outstanding service and dedication to the principles of Rotary. 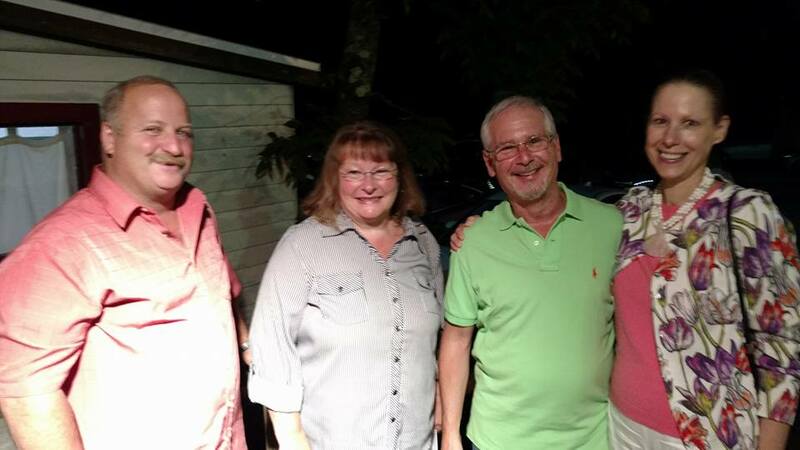 Past District Governor Nick Constantino was on hand to assist in the ceremonies and current Assistant District Governor Susan Kraycer did the honors of installing Lori Orestano-James, President; Jacob Lerner, President Elect; Barbara Carr, Treasurer; and Orshii Boldiis, Secretary. More Celebrations & Honors from the past few weeks - Boy....we've been busy! Our club is joining forces with the Liberty Rotary Club to aid victims of Hurricane Harvey. Local groups are headed to Texas to assist the regions affected by Hurricane Harvey, according to a press release from the Liberty Rotary Club and Monticello-based nonprofit Operation Endeavor. The groups are working with the Federal Emergency Management Agency to plan a response for areas that aren’t receiving as much assistance as the urban areas. Aid efforts are also being coordinated through Rotary Clubs in the Houston area, the release said. The five-member team includes Stuart Hirsch, director of operations for St. Mary’s Hospital Emergency Services in Connecticut. The other members on the team are Naval Corpsman Lawrence Smira and paramedical and rescue professional Charles Atwell, Charles Lee Miller and Thomas Andryshak. Hirsch, a Liberty Rotarian, is also the president of Operation Endeavor. 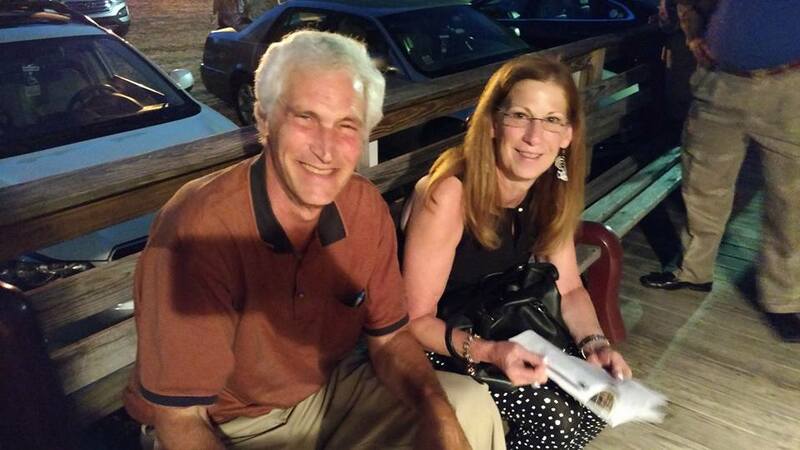 Gary Silver, Susan Kraycer and Gary Siegel are other Liberty Rotarians on Operation Endeavor’s board of directors. The Liberty Rotary Club has contacted thousands of Rotarians in the New York region to donate to the effort. OR you can make a check payable to Monticello Rotary Club with "Operation Endeavor" noted in the memo space and bring it to a meeting. Operation Endeavor is a nonprofit that provides rescue, emergency medicine and trauma training and supports disaster preparedness in developing regions of the world. 2017 - 2017 Officers Installed! On June 27th, the Installation of Officers ceremony took place at Ciao Bella's Restaurant! The ceremony was performed by Past District Governor, Nick Constantino. 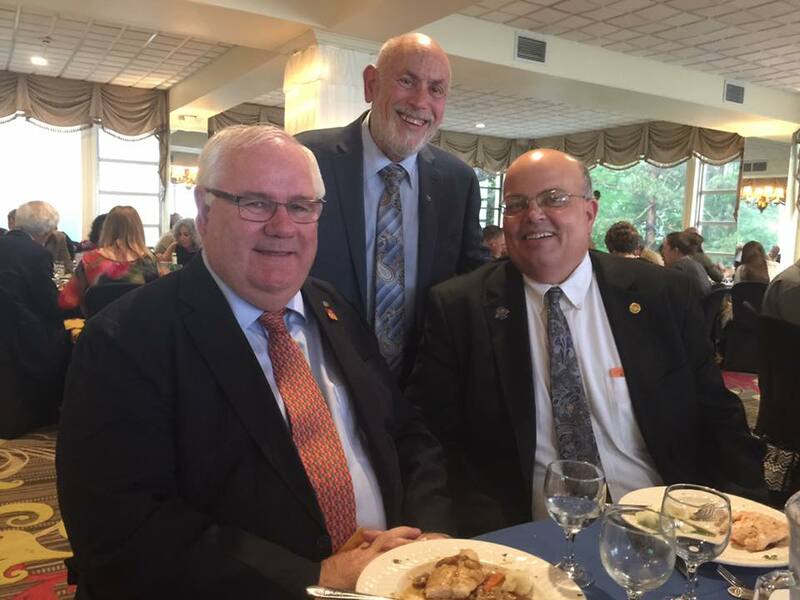 Incoming District Governor, Jim Damiani was present, as well as Asst. District Governor Amador Laput! Barbara Carr was installed as the 2017 President, along with First Vice President, Lori Orestano-James; Second Vice President, Jacob Lerner; Treasurer, Fouad Kerendian; and Secretary, Orshii Boldiis. Monticello Hosts Region 5 Meeting! Monticello Rotary Club hosted a Region 5 Meeting at Albella's Restaurant on June 20th! Clubs from the Region shared success stories and ideas for the upcoming year. six students from the Monticello and Fallsburg school districts! Scholarship Dinner on June 13th at Albella's Restaurant. 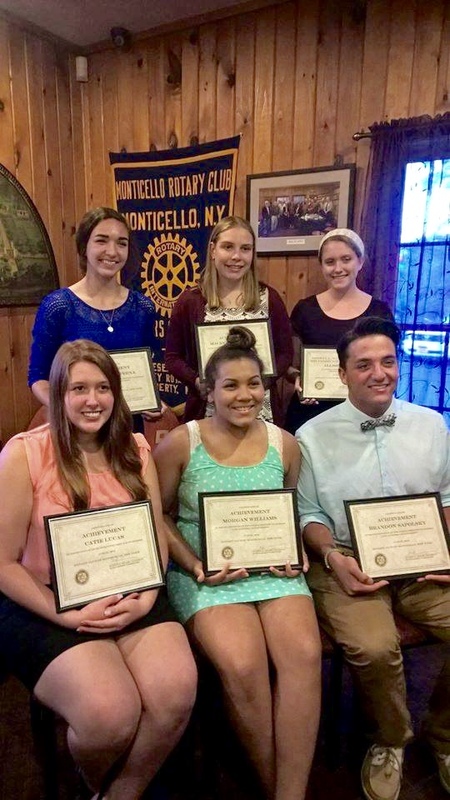 Officers from the Monticello and Fallsburg Interact Clubs were recognized at the June 6th meeting. Congratulations to the clubs for an outstanding year! Thank you Erik Rhulen for sharing your view of the Sullivan County Real Estate Market with our members at Tuesday night's meeting! George Phillips from Reclaim New York presented to our May 23rd meeting. Relcaim New York is a non-partisan, non-profit organization that empowers New Yorkers through education and civic engagement to reclaim ownership of their government. Receive updates and news from Reclaim New York at ReclaimNewYork.org/SignUp. We were very happy to see Leo and her host "Mom" at the meeting! Rick Stein shared Rotary flags and magazines from his Rotary Club Visits in Japan! At the "Night Out" held at the Ethelbert B Crawford Library, a donation of $750 was made to the Sullivan County Veteran's Coalition in the name of Jeff Bank. This donation was part of a donation to the Rotary Club from Jeff Bank for their sponsorship of our Annual Monster Race. Jeff Bank employees will participate in the race, either walking or running, as part of Jeff Bank's Healthy Work Environment initiative. After the presentation, we were entertained by Dylan Foley, Irish Champion Fiddler. Rotarian Randy Katz was the guest speaker at our February 28th meeting. He gave an amazing presentation with lots of interesting details and stunning photos of his recent trip to South Africa, that included a safari. Kathy Kreiter from the Sullivan County Federation for the Homeless was the guest speaker at our February 11th meeting. She has been a guest speaker at our club in the past and as usual she gave us an update on what's been happening at the Federation. The Federation for the Homeless has the largest food pantry and provides the largest number of meals in Sullivan County. Kathy said that she has obtained more funding by actively seeking out and applying for new grants. This has made it a little easier to run the organization. They were even able to put a new roof on the building. She said that in 2011 the Federation for the Homeless lost a major funding grant and almost had to close. It was saved by Assemblywoman Gunther and others. Today the Federation is thriving and growing with new programs and services, one of which benefits the youth in the community and will eventually provide a new revenue stream for the Federation. Kathy answered additional questions and was well received by our members. Rotarians Doug Muller and Joe D'Abbraccio made a $500 donation to the Federation. Kathy was speechless. The following discussion reviews the recent presentation of China City by Ms. Sherry Li. As part of the review, I have included some cursory research that I conducted, which may be helpful in providing you with some historical background as to how China City has evolved over the years. On January 10, 2017, Sherry Li, the CEO of China City (also known as the Thompson Education Center), made an oral and slide presentation before the Monticello Rotary Club1. The proposed 575-acre development, called China City2, is on a parcel of land that is off Route 17, Exit 112, which borders Wild Turnpike in the Town of Thompson and extends to the town of Mamakating. China City will be an educational institution that offers college level courses to students primarily from China. It is expected that the student body will also include Americans, as well as non-Chinese foreign students. China City will offer four majors: business; movie, media and arts; culinary; and nursing. Depending upon their majors and career goals, some students will matriculate for four years at the college, while other students will be at China City for only one year, while spending the other three years in China where they will graduate. Ms. Li indicated that China City has executed several letters of understanding. One is with Catskill Regional Hospital, regarding the nursing program; and another is with Phoenix, a Chinese media company that is educating 80,000 students. The college will grow in stages, and at its final phase will have a 2,500-student body. The guest speaker at our December 6th meeting was Cindy Menges from Delaware River Solar, a new community solar energy company. Ms. Menges said that she's trying to spread the word about what her company does. She gave a slide presentation about the various types of renewable energy, why renewable energy is needed, and how Delaware River Solar fits into that picture in New York State. “The United States depends heavily on Coal, oil, and natural gas...”, said Cindy, “These are finite resources”. Ms Menges stress that we need to develop other sources of renewable energy and solar is one of them. Governor Cuomo's Energy Initiative seeks to have 50% of the energy generated by New York State come from renewable sources by 2030. New York State is also providing incentives to businesses and homeowners who switch to renewable energy sources. It is also hoped that the shift to renewable energy will spur economic development. Ms. Menges concluded her presentation by talking about solar energy options that are available to businesses and residences in Sullivan County through her company. The guest speaker at our Nov. 29th meeting was Tony Poli from the Sullivan County ATV Association, a non-profit organization that holds ATV (4-Wheeler) trail run fundraising events twice a year throughout the woods of Sullivan County. The proceeds from their events benefit families with children with special needs. Mr. Poli gave a very interesting account of how the Sullivan County ATV Association and its fundraising events started in 1999 at Mr. Willys restaurant with about 90 participants. It was so successful that people asked if it could be held again on an annual basis. The ATV trail Poker Run event has remained very popular over the years and is now held twice a year. Although the attendance at the events has dropped recently from its peak of over 700, the ATV trail events still draws 300 – 400 people. The Sullivan County ATV Association has given out over $240,000 to children with disabilities since it started. Mr. Poli tried to explain how difficult it is to hold the ATV trail run events. “It’s a lot of hard work”, he said. New York State does not provide any places to use ATVs, so private owners are asked for the use of their properties. Tony is involved with contacting property owners for permission to go through their land, setting up contracts where necessary, clearing and cleaning the trails, as well as putting up and removing the signage along the trails for the events. He said that they’ve gotten pretty good at running the things, but most of all, he loves being out in the woods of Sullivan County. People come from all over the United States to participate in the ATV trail events. Mr. Poli said that he wished more people in Sullivan County would realize what a wonderful and beautiful place they live in. 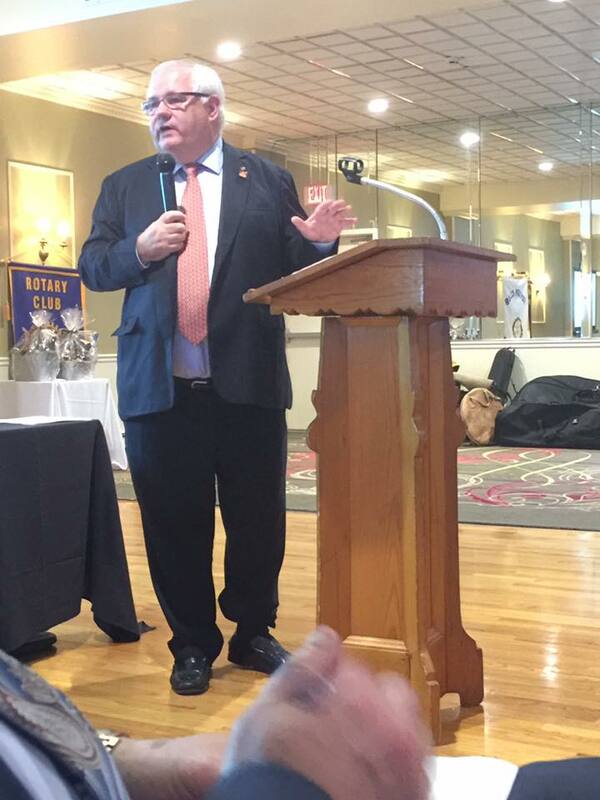 Past District Governor Nick Constantino visited our club on November 22nd. He performed the induction ceremony of new member Juliette McKerrell and he was our guest speaker for the evening. As always, it's a great evening of fun and fellowship when PDG Nick visits our club. His down to earth humor and wit make for an entertaining meeting. PDG surprised everyone with a pop quiz about Rotary. It eventually turned into an informative walk through the history of Rotary, from the beginning to the present day. It became clear that Rotary has made great strides, but challenges remain. Rotary will continue to be relevant only if clubs are able to adapt to the changing world with innovative ideas and programs that appeal to the younger generation. Angela Dutcher, Executive Director of the Literacy Volunteers of Sullivan County, was the guest speaker at our November 1st meeting. Ms. Dutcher has spoken at our club before and our club is a long-time supporter of her organization. She began her presentation by announcing that the Literacy Volunteers has embarked on a program to work with Ideal Snacks, a major employer in our area, to improve the literacy levels of their employees. The Literacy Volunteers is willing to work with any employer who wants assistance with tutoring ESL employees. The Literacy Volunteers also has a program that helps Monticello High School student dropouts earn their GEDs. The graduation rate of Monticello high school is only 77%. Being a high school dropout is no guarantee of failure. Ms. Dutcher herself was a high school dropout, but she went and got her GED and then went on to college to get her degree. The Literacy Volunteers works very closely with B.O.C.E.S. They are often called upon to help tutor B.O.C.E.S. students who are having difficulty with reading. Most shocking is the continued high rate of illiteracy in Sullivan County and more specifically in the village of Monticello. The link between illiteracy and continued poverty is clear. Ms. Dutcher read a series of statistics that supported her statements. The median income for per capita in Sullivan County from 2010 – 2014 was approximately $25,000. In the village of Monticello is was $18,000. The coming of the Casino to our area highlights the need to have a more literate workforce and people capable of being trained to do the jobs that will be available. Ms. Dutcher fears that many people in our area won't be qualified enough to get the jobs due to poor reading skills and a lack of education. She cited a similar circumstance that occurred when Walmart first came to our area. The bottom line is that the Literacy Volunteers is a volunteer organization that wants to help people who want to learn to read in order to better themselves and create opportunities for a better life. The problem is... They desperately need volunteer tutors to help with their programs. Ms. Dutcher said that she could hold GED and ESL classes every day of the week, but she doesn't have enough volunteer tutors. Tutors are needed one to two days a week for 2 hours, to tutor a student. Tutor training is much easier now because the training is done online at the Literacy New York website, at your own convenience... and it's free. 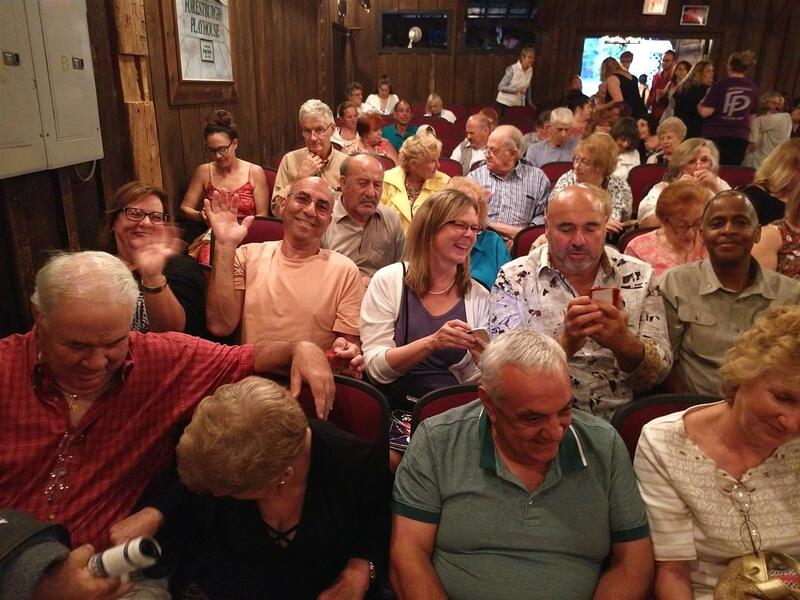 During the discussion/Q & A period of the presentation president John Greenbaum suggested that perhaps senior citizens with time on their hands could be a source of tutors. Ms. Dutcher agreed and thanked him for the suggestion. If you know anyone willing to become a tutor for the Literacy Volunteers of Sullivan County, please contact Ms. Dutcher at 845 -794-0017.. Please help. District Governor Louis Turpin and Assistant District Governor Amador Laput visited our club on October 25, 2016. AG Laput introduced the District Governor who is a retired architect and a very involved Rotarian. DG Turpin is the "Shelter Box" program's representative to Rotary, he is on numerous boards, and he works with Nobel Prize Peace Laureates. DG Turpin began by saying he was in our shoes not too long ago with regard to the District. “I had no idea who the District was.”, he said. He has since found out. The district consists of people who are there to support Rotary clubs with service projects they do in their local communities and the world community. “Rotary is an amazing organization” DG Turpin said, “and we should all be very proud of the way we serve humanity”. Many other organizations focus on a single aspect of service. Rotary doesn't do that. Rotary has six official areas of focus for how we serve humanity. Those areas are: Fighting diseases (the Polio-Plus program), Maternal and Child Health, Fresh Water and Sanitation, Education and Literacy, Economic Development throughout the developing world, and finally Peace and Conflict Resolution. Rotary was instrumental in helping form the United Nations. Rotary sees a need and figures a way to solve it. DG Turpin said that he was aware of our club and the great things we do in community. He then challenged our club to step back and take a look at how we could take on new service projects that would benefit not only our local communities, but also benefit the world. DG Turpin spoke about the word team. The word TEAM means: Together Everyone Achieves More. Great things can be achieved working with the District and our club leadership. Shelter Box is a program that was started a Rotary Club service project. Shelter Box is an international relief organization that provides a box that contains shelter and other supplies to provide hope and dignity to the families who have lost everything during a disaster. Most recently, shelter boxes were in Haiti even before the latest hurricane arrived. DG Turpin handed out a brochure which listed the District leadership team and the District goals for the coming year. The main goal of the District is for each club to have a “Hands-on” service project does “good” whether in the local community or abroad. A visible service project is one way attract the attention of your community and let them know what Rotary is about. A visible service project is also a way of attracting new members. This year's District theme is “Do Good Have Fun We are Rotary” which is a good way to quickly describe what Rotary does. Our guest speaker at the October 18th meeting, Truth Muller, gave an informative and extremely entertaining presentation on the subject of “Bats”. Mr. Muller, a high school senior, showed an incredible breadth of knowledge about his subject, along with excellent public speaking skills that held our attention for nearly an hour. Truth began his presentation by asking everyone how they felt about bats, whether they liked or disliked bats. There seemed to be about a 50/50 split among the members. He then went on to describe some of the usual myths surrounding bats, the most common being that they drink your blood. There are a variety of vampire bats that live in Mexico and South America that prey on livestock by making a small cut and then lapping up the blood. They don't attack humans. Doug gave a great presentation about his experience as Mayor of Monticello and what he hopes to continue to achieve. Doug noted that there were serious concerns with the police department under the previous board as budget cuts really hindered the police department and actually resulted in vital staff cuts. The PD was down to only one detective from historically having three to four. Officer numbers were also in decline but with recent board changes the PD has grown to meet the demand of the village and event to an appropriate number. Mayor Solomon feels that this will help address concerns of crime. The Monticello Rotary Club gave out nearly $8,000 in scholarships to students from Monticello Central Schools and Fallsburg School Districts last night! Congratulations to all the students and their families! 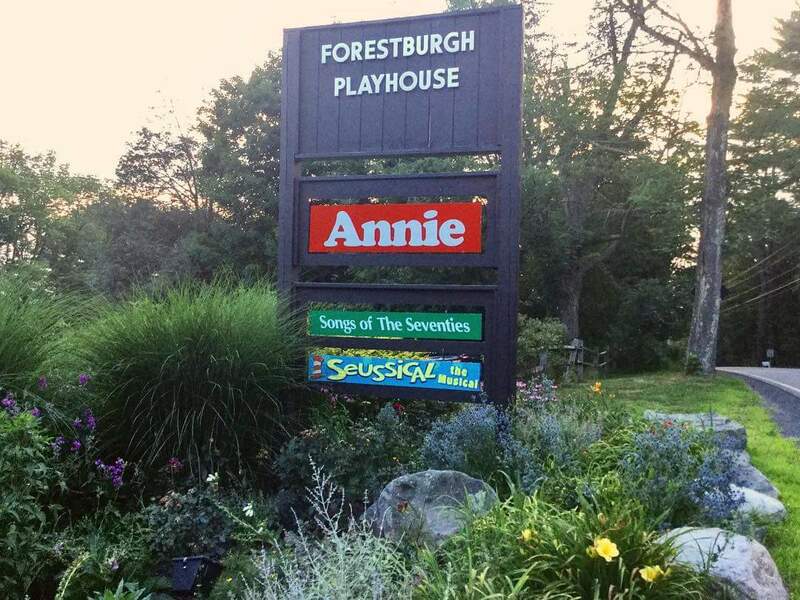 Founded in 1947, the Forestburgh Playhouse is the oldest continuously operating professional summer theatre in New York State. 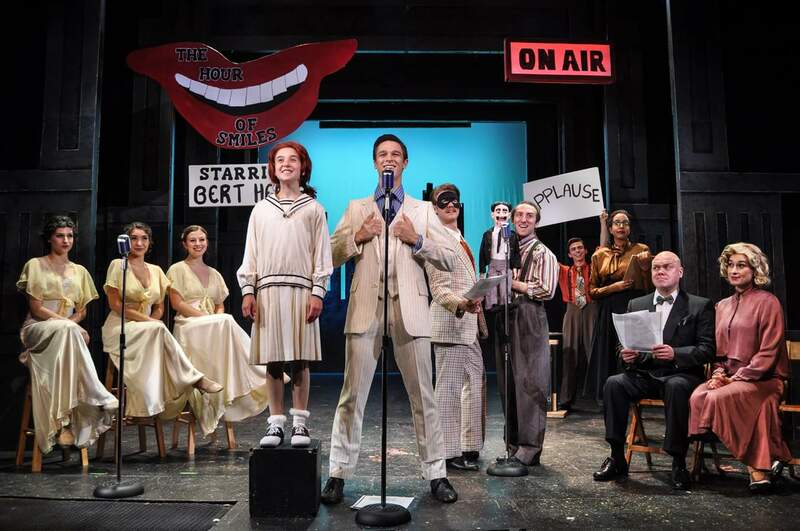 Under an agreement with the Actors’ Equity Association, the union of professional actors and stage managers, the Playhouse employs professional actors, often with Broadway or other major credits, as well as a company of non-union professionals who earn credit toward their own eventual membership in the Actors’ Equity Association. The Forestburgh Playhouse operates during the summers only, from mid-June through Labor Day, and offers 3 different types of performance experiences: Broadway musicals and plays on the main stage, a youth theatre production performed at 11 AM on Thursdays and Saturdays, and musical cabaret performances presented with dinner in the adjoining Forestburgh Tavern during the week and a late-night cabaret Friday and Saturday after every evening performance.